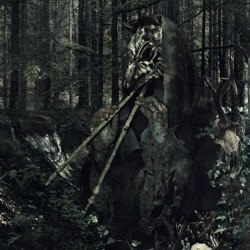 Italian atmospheric black metallers Selvans, have revealed the first details of their upcoming debut full-length album, which is due for release on Avantgarde Music in October 2015. Titled “Lupercalia”, the album is composed of six tracks, each lasting an average of ten minutes. The new album continues Selvans’ idea of combining music, lyrics and aesthetics in such a way as to recreate the folklore of Italy’s ancient peoples. As a consequence, the visuals, both in terms of album artwork and live sets, is an important aspect for the band. For “Lupercalia” Selvans has once again turned to Diletta of E.B.A. Art, whose first collaboration occurred on the band’s five-track EP “Clangores Plenilunio”, which was released on Avantgarde Music in February 2015. Diletta’s artwork brings to life the designs of founder and frontman Selvans Haruspex in a much lauded way. “Lupercalia” was recorded at the Faunalia Studios and in Patrizio Tamborriello’s Soluzioni Audio. The lineup on the album comprises Selvans Haruspex on keyboards, traditional instruments, vocals and programming, and Sethlans Fulguriator on guitars and bass. The album will be available both as a CD in A5 format and digitally. Apart from the tracklist, the band has also released a video teaser that you can see below, including excerpts of each of the tracks.